Live in marshes and wetlands along the Bay and its creeks and rivers. Also found on freshwater lakes, ponds and impoundments. Most often be seen wading silently in shallow water. Found year-round throughout the Chesapeake Bay region. The great blue heron grows to 4 feet tall with a 6 to 7 foot wingspan. Despite its large size, its hollow bones allow it to weigh only 5 to 6 pounds. It has a white head with long, black, feathery plumes; a long gray or brownish neck, often held in a graceful S-shape; a bluish-gray body; and underparts streaked with black, brown and white. Its neck and back are covered in shaggy feathers. 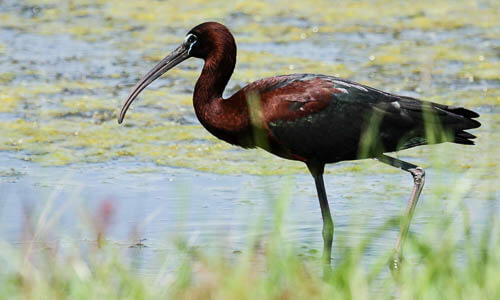 It has a yellow, spear-like bill and long, chestnut legs. The great blue heron eats mostly fish, but will also feed on insects, amphibians, crustaceans and other small animals. It silently stalks its prey in shallow waters, then plunges its bill into the water to capture it. It will spend about 90 percent of its waking hours hunting for food. Field Guide: Great Blue Heron (Ardea herodias) from Chesapeake Bay Program on Vimeo. Crows and ravens eat heron eggs. 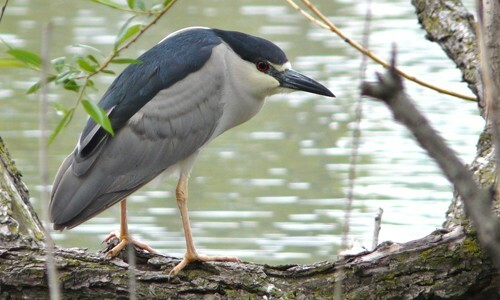 Hawks, bears, eagles, raccoons and turkey vultures have been known to prey on young and adult herons. The great blue heron flies with slow, deep wingbeats, holding its neck in a graceful S-shape. Great blue herons will make 3 to 4 hoarse croaks when alarmed. Herons will nest and breed in colonies, called rookeries, with other herons. 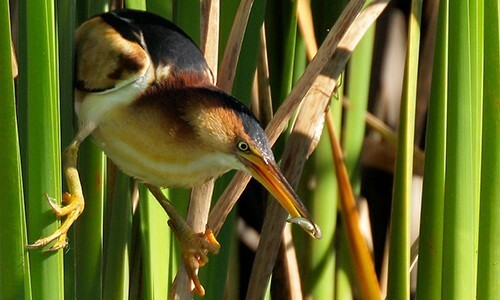 Rookeries are located in isolated areas such as wooded swamps and small islands, where human and predator access is limited. Breeding may begin as early as February, with new breeders continuing to arrive at the colonies well into May. Males will build a nest of sticks and twigs high in the canopy of a tree. Females lay 3 to 7 eggs from mid-March to mid-June. Both parents incubate the eggs for about 28 days. The peak of hatching takes place from mid-April to mid-July. Although they may have several eggs, the parents usually only raise one or two young; the others starve after hatching. The young fledge after about 60 days. Great blue herons usually live for approximately 15 years. Great blue herons are the largest heron in North America. Herons have been known to choke to death while trying to swallow prey that is too large. Specially-shaped neck vertebrae allow great blue herons to curl their neck into its characteristic S-shape for flying and hunting. Great blue herons are able to hunt during the night as well as the day.